Kansas Isn't Spending Enough On Its Schools, State's High Court Says : The Two-Way The current funding system can't "have all Kansas public education students meet or exceed the minimum constitutional standards of adequacy," justices rule. 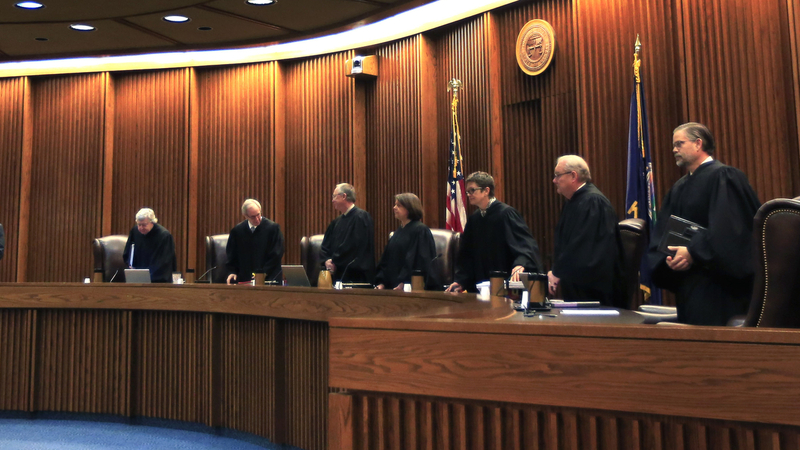 Justices in the Kansas Supreme Court, seen here in a photo from 2015, say the state's funding for public education has fallen far below recommended levels. In Kansas, the state's public school finance system "is not reasonably calculated to have all Kansas public education students meet or exceed the minimum constitutional standards of adequacy," the Kansas Supreme Court says. The court ruled Thursday in a a much-watched case about state obligations to provide public education that was originally filed by four school districts — including Kansas City, Kansas Public Schools — back in 2010. With the decision, the court also gave state lawmakers time to devise a new school financing system, setting a deadline of June 30. "Plaintiffs have shown through the evidence from trial—and through updated results on standardized testing since then—that not only is the State failing to provide approximately one-fourth of all its public school K-12 students with the basic skills of both reading and math, but that it is also leaving behind significant groups of harder-to-educate students." Citing data from the 2015-2016 school year, the court said that nearly half of the state's African American students and more than a third of its Hispanic students are not proficient in reading and math. More than a third of students who receive free and reduced lunch are also not proficient in those essential subjects, the court said. The court also said the plaintiffs had provided evidence establishing a link between funding levels and student performance. The plaintiff districts' case, which was argued in court last September, centers on two questions: equity, which is about the way the money is distributed; and adequacy, which asks whether the amount budgeted is enough for the state to fulfill its duties to provide K-12 public education. The justices noted that in Kansas, the "base state aid per pupil," or BSAPP, had risen from $3,600 back in 1992 to $3,890 in 2002 — and gradually rose to $4,400 for fiscal year 2009. But during the recession, appropriations fell steadily, and by fiscal year 2012, the legislature had reduced BSAPP to $3,780, passing on costs of more than $511 million to local districts. In every year from 2009 to 2014, the Kansas State Board of Education has asked the legislature to fund the BSAPP at $4,492. Citing educational studies and other evidence, the court states today that "a BSAPP amount near $4,654" might satisfy the state's constitutional requirement, if it adjusts its financial aid formula. The high court had already sided with the plaintiffs on the equity question and ordered remedial actions, which the legislature took up in a special session. "We ultimately held that for the 2016-2017 school year, the legislative response cured the constitutional inequities confirmed to exist in our previous decisions," as the justices said in today's opinion. In the past year, Kansas' school funding system has gone through several twists and turns. Last June, state legislators approved a $38 million funding boost for poor school districts — but only after the Kansas Supreme Court rejected a previous fix as "inequitable and unconstitutional," as NPR reported. Those developments came as the state's public schools were poised to be shut down in July. Kansas is one of more than a dozen states that have faced lawsuits from parents and school districts over funding levels, as reporter Sam Zeff of member station KCUR has noted. "The state argued that every public school in Kansas is accredited and an analysis by the Kansas Association of School Boards (KASB) says Kansas schools rank 10th in the country. "But the plaintiff districts, including Kansas City, Kansas Public Schools, said up to a third of Kansas students are not succeeding and unless the state comes up with $800 million more in funding things are just going to get worse."